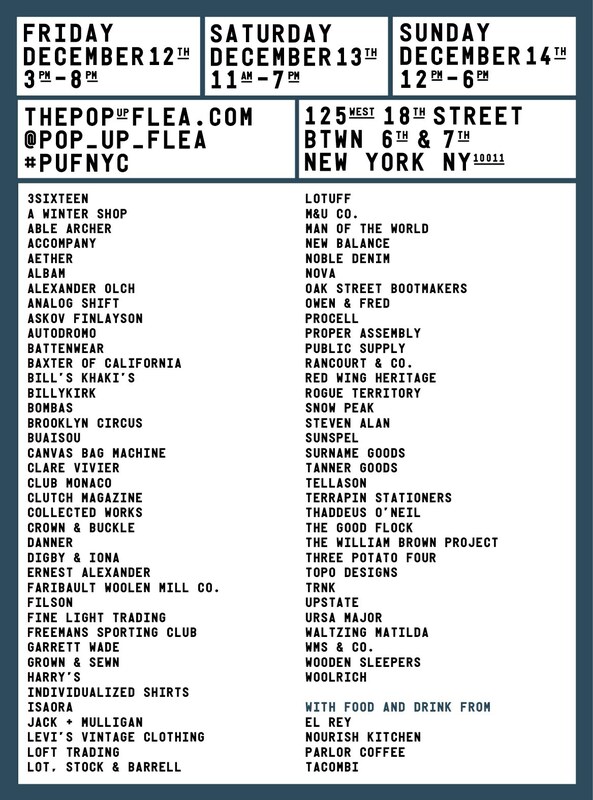 Coming Home | Pop Up Flea NYC | A Continuous Lean. After traveling around the world these past few months, next weekend The Pop Up Flea lands back home in New York City just in time for the holidays. This is the grand poobah of all The Pop Up Flea’s, with over seventy brands joining us at the Metropolitan Pavilion in Chelsea for our largest event ever. From five year vets like Billykirk, Alexander Olch, and Tanner Goods to first-timers Waltzing Matilda, Garrett Wade, Tudor and Askov Finlayson we’ll have all the finely crafted curiosities that you’ve come to expect from team PUF since 2009. Adding to the New York event this year will an indigo dying station from Buaisou, which we first introduced earlier this year in Japan and many more options for one-of-a-kind finds. This is the big one, so don’t miss it. More info and the complete brand list after the jump. Will the Buaisou dyeing demonstration allow attendees to try dyeing their own items? I was hoping Cadillac would be there. @Greg – No outside items for the Buaisou setup. They’ll have tote bags, wine totes, and hanks there. Source – Buaisou email.